As the Black City district is being redeveloped and renamed White City, contrasts between past and present in this oil–rich country could hardly be clearer. 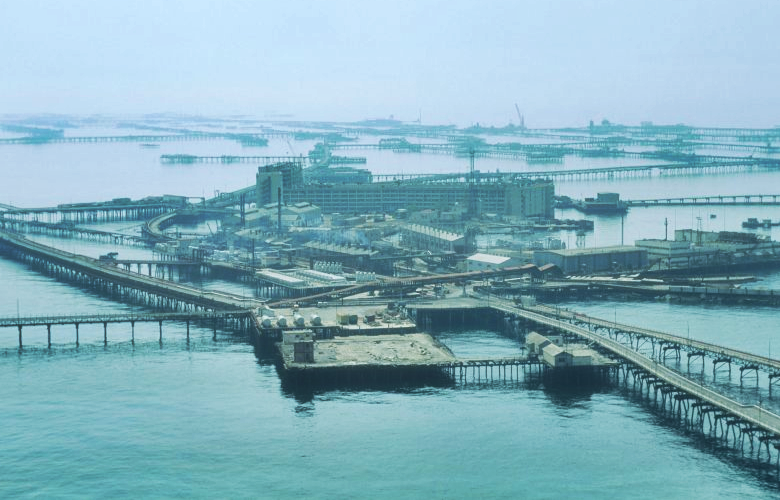 30 miles off the coast of Azerbaijan lies Oil Rocks, an entire city built on stilts above the Caspian Sea. Oil Rocks, Neft Daşları, was the world’s first offshore oil platform. Built by the Soviets in 1949 and still in use today, it was built as a Stalinist utopia where 5,000 oil workers would live and work for weeks at a time. There are bunkrooms, bakeries, laundry rooms, vegetable gardens and even a park created from soil shipped out from the mainland. Archive footage from shortly after shows happy Soviet workers, whipped by the sea breeze, living self-sufficiently in their ocean home as waves crash upon the metal struts below. Lorries speed along 200 miles of roadways, on bridges and platforms built upon a foundation of sunken oil tankers. Even before its construction, Azerbaijan was already producing three quarters of the USSR’s total oil output. But in 1946, Stalin ordered for oil production to be tripled over the next 15 years – and the success of Oil Rocks was to be crucial to this plan’s success. Since then, it has produced more than 170 million tons of oil, and 15 billion cubic metres of natural gas. Today, however, those Soviet dreams rust and crumble into the waves. Two thirds of the roadways have fallen into the Caspian Sea and many of the remaining roads lead off into nowhere. Neglected, it struggles on; it will cost more to decommission and deconstruct that it does to keep it working. But, while it continues to function as an oil well, staff levels have more than halved and it now produces only around two per cent of the country’s oil. I flew to Baku, Azerbaijan’s capital city, drawn by a rare invitation to visit Oil Rocks. I had leapt at the chance: foreigners – especially foreign journalists – need special permission from the state oil company Socar, which can take years to negotiate. Even once permission has been granted, access is only via helicopter or a six–hour boat trip. But by the time I arrived, it appeared that the invitation had been withdrawn. “I think it will not be possible,” my smiling press contact told me on arrival, so cheerily that at first I believed I must have misheard her. “It is not possible,” confirmed a less congenial man employed by my hosts, a company owned (like so much of Azeri big business) by Kamaladdin Heydarov, the Minister for Emergency Situations. Further pushing on my part was simply stonewalled. There would be no trip, they said, as if it had never been an option. Foreigners may not visit “for security reasons”. Oil Rocks is no longer what the Azeris want us to be looking at. Once a source of national pride, this crumbling industrial relic is now something of an embarrassment. It does not fit in with Azerbaijan’s new image as a hip, monied oligarch’s playground. Since gaining independence in 1991, the country has undergone an immense reinvention. So much was steamrollered by the Communists – mosques demolished, mansions stripped of their finery, utilitarian factories and housing built in their place – but with their newfound wealth, they are buying back an identity. Medieval ruins are painstakingly rebuilt, relics returned from Hermitage archives, celebrity architects given carte blanche and big budgets. Stanley Escudero, a former US ambassador to Azerbaijan, told me: “In immediate post-Soviet times Baku was characterized by a combination of the instant rubble created by the Soviet Union alongside the decaying charm of European-style buildings [built] after the First World War. The streets were narrow and utilities routinely failed. There was no economy worthy of the name. The Black City district, an industrial port where cranes litter the waterfront and the smell of petroleum hangs heavy in the air, is being ripped out and redeveloped by a British partnership that includes the architects Foster + Partners. The 221 hectare site will include a grand square and boulevard, and 50,000 homes. It’s new name? White City. In some ways the tactic is working. The city centre is clean and feels safe. Luxury brands line the main drag: Tiffany, Dior, Gucci, Armani. Seven five-star hotels have opened in two years. The world is beginning to take notice. “We have seen a very rapid increase in visitors to the country,” said Aydyn Ismiyev, head of tourism at the Azeri Ministry of Culture. “In 2001, we had 420,000 tourists. By 2007, that figure was 1m, and last year 1.95m.” So there is sharp growth, albeit from a small base. By comparison, England’s Lake District alone receives around 10m visitors a year. But there are serious doubts as to whether this transformation reflects a deeper change within the country. Nominally a democracy, Azerbaijan’s elections are plagued by claims of malpractice. The current president Ilham Aliyev inherited his title from his father, a former KGB general who led the country under the Soviets. Inequality is growing and corruption is rife. And there is something perverse about the grand efforts being made to disguise the trappings of heavy industry in a country where it still is so ubiquitous. The shopping district may have been scrubbed within an inch of its life, but oil still shimmers on the surface of the water in the bay across the road. Only a few miles from the centre the first oil wells begin to sprout. At first they are screened from view by a series of gleaming 10ft limestone walls, then by neat hedges, finally nothing at all. Soon a forest of rusting oil derricks and bobbing pumpjacks stretches out in all directions. So much oil and gas is concealed under the earth that it periodically bursts through the surface. At Yanar Dag, half an hour from the capital, a fire has been burning on a rocky hillside for more than 50 years, where natural gas seeps out through vents in the sandstone. Thanks to these riches, Azerbaijan now produces around 50 million tons of oil a year and now seeks to challenge Russia’s dominance of the European market via a new pipeline that snakes from the Caspian through Georgia and Turkey to the Mediterranean. The source of Azerbaijan’s newfound wealth is obvious to all, to anyone with eyes. But even on dry land, the authorities are not keen for visitors to get a close look. I travelled inland with two French photographers who were keen to get images of the oil industry in action. So when our minibus pulled over we jumped out to inspect a nearby well. Our Azeri guide, Balash, was up in arms. “Here is absolutely prohibited,” he said, pacing the ground. “Why you not listen?” But the photographers had already gone. I followed, murmuring apologetically. The pumpjack nodded to itself, eerily keeping time. The belt was whirring, the gears sliding. Each stroke pumps around 40 litres of oil out of the ground. I clambered up a dune towards it, then stopped dead to stop myself slipping down into a wide dark pool. Crude oil, like treacle, had leaked from the well and was leeching slowly into the sand. Empty bottles and tyres were drowning in the thick, black, tarry mess. 2,500 miles from home, frustrated by the constraints and the dissolving prospect of an Oil Rocks visit, I staked out a press conference where Socar’s CEO Rovnag Abdullayev was due to attend. He, I was told, is the genie of the oil lamp who would grant my only wish. Only he can sign my permission slip. I waited three hours; he didn’t turn up. As a replacement activity I was instead taken on a tour of one of Baku’s many luxury hotels. We drove out along the Absheron Peninsula, which juts rudely into the Caspian Sea, where politely I inspected the ornate ballroom, spa and a gilded presidential suite that goes for €8000 a night. There was sushi in the top floor restaurant and boogie woogie from a transparent grand piano in the bar. It was being styled as a beach resort – temperatures in Baku can top 40ºC in summer – despite the Caspian’s well-known water pollution problem: oil fields and tankers are thought to leak around 120,000 tons of oil-related pollutants into the sea each year. “There is no problem here,” the hotel manager reassured me. From a balcony overlooking the beach I spotted long, meccano-like structures on the skyline – towering rigs, linked by long platforms on stilts. “Is that it? Is that Oil Rocks?” I chattered, ecstatic. The manager nodded, bemused at my excitement when I was surrounded by such opulence, and as she did a huge yellow helicopter flew overhead, ferrying the workers out to the settlement. I was so close I could see it. But you’d have thought we existed in two parallel universes. Today Azerbaijan’s vision for the future can still be found off the Caspian coast, but 20 miles further south. Another sea-city is currently under construction: a series of artificial islands in the shape of a lobster will host hotels, a yacht club, an airport and, at 3445ft, the world’s tallest building. Each new claim from the developer Avesta Concern is more fantastical than the last. The project reportedly has a budget of $100bn (roughly 160 per cent of Azerbaijan’s GDP) and will house 800,000 (equivalent to 8.5 per cent of the entire country’s population). There will be a Formula One racetrack! A new Disneyland! Fuad Gambarov, Avesta Concern’s head of business and investment, told me: “Since the project began in 2011, more than €1bn has been spent. The new city will be over more than 24 islands, big and small. We think and people also prove that there is real demand for such a city. Every year, the economy of Azerbaijan grows higher. I’m driven past the site, marked by a forbidding white arch like two enormous tusks jutting from the dry ground. The largest of the islands has already been formed, and work is underway on several buildings including a restaurant in the shape of a flying saucer. This new island utopia is built of capitalist dreams. It is separated from Oil Rocks by only a few miles of sea – but an ideological ocean.